Long-range imaging of the eye using the CS800-841/28 enables much deeper penetration into the eye than would be possible with conventional 800 nm OCT imaging. OCT imaging has traditionally required the use of longer wavelengths to probe depths greater than a few millimeters in a single scan, bringing with it the higher cost associated with NIR detectors. Not to be deterred, we have developed a patent-pending optical spectrometer design that allows us to achieve imaging depths of up to 12 mm using 800 nm OCT, opening up new possibilities for cost-effective application of long-range imaging to ophthalmology, medicine, and nondestructive testing. 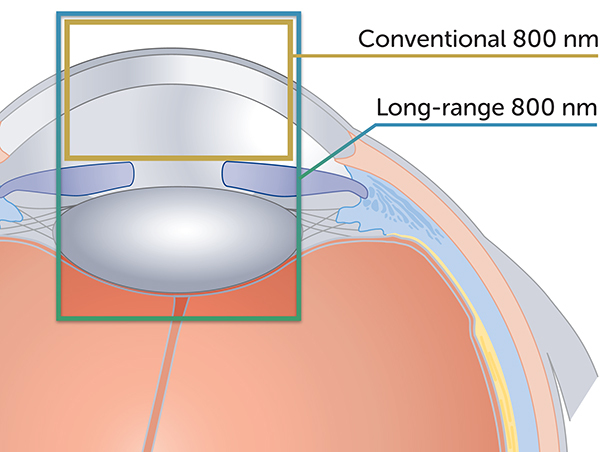 In ophthalmology, long-range imaging is beneficial for examination of the full anterior chamber, from cornea to crystalline lens, as it permits a more complete image of the eye to be acquired in less time for assessment of eye health. It can even be used to image the whole eye if configured appropriately. It also facilitates wide-field imaging of the retina, the curvature of which requires a greater range of imaging depth, particularly in clinical settings where the patient is unlikely to remain static. Image of the eye, anterior chamber, and lens taken by the new Cobra-S long-range imaging spectrometer, CS800-831/28. In medicine, long-range OCT can be of great benefit for lumen imaging in intravascular and gastrointestinal applications. In such scenarios the structures of interest may be more than a few millimeters from the imaging catheter, and therefore fall outside the typical OCT imaging window. A long imaging depth can account for such variability in distance between the imaging probe and area of interest, facilitating better imaging outcomes. 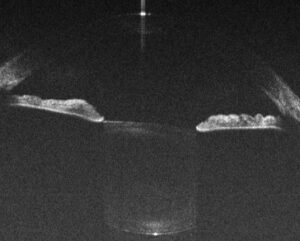 In general, the ability to image deeper facilitates wide-field imaging, as the full profile and structure of curved surfaces can be captured in a single scan. This is useful for nondestructive testing in materials processing applications, where a particular cut or hole may run deep, and for profiling complex surfaces in additive manufacturing. Imaging range in SD-OCT depends on both the center wavelength, and on the bandwidth of the light source. As center wavelength increases, so too does the imaging depth (at the expense of spatial resolution). Traditionally, 1300 nm has been the preferred wavelength when imaging depths of >5 mm are needed. Our Cobra 1300 spectrometer series offer 1.4-11.5 mm imaging depths (in air), depending on the bandwidth. As bandwidth increases, however, imaging depth decreases. Thus narrower bandwidth systems are used when deeper imaging is needed. Though 1300 nm OCT provides sufficient depth for long-range imaging of many structures, it comes at a cost. Use of this wavelength requires InGaAs cameras, which are significantly more expensive than the CCD or CMOS cameras used for 800 nm SD-OCT. By moving to shorter center wavelength (CWL), the spectrometer cost can be reduced by ~40%, but the bandwidth (BW) must be also be reduced in order to maintain the same spatial resolution. This drives the bandwidth for an 800 nm long-range imaging system to below 30 nm for an imaging depth of 12 mm in order to maintain equivalent spatial resolution. While it is possible to increase the dispersion of the grating in the spectrometer to achieve this, the optical design must also be capable of resolving the light falling on each adjacent pixel. This translates into extremely high spectral resolution – below 0.02 nm! To translate the benefits of long-range imaging to 800 nm SD-OCT, we have applied our expertise in spectrometer design to develop an OCT spectrometer with ultra-fine spectral resolution. 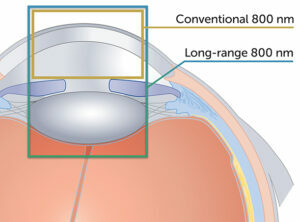 This patent-pending optical design represents the newest model in the line of Cobra-S 800 spectrometers, CS800-841/28. It is capable of 0.015 nm resolution over a 28 nm bandwidth centered at 841 nm. This allows us to image depths up to 12 mm, extending the range of 800 nm SD-OCT by a factor of three. Our new Cobra-S 800 long-range imaging model has been designed to minimize roll-off with diffraction-limited optics and a low-crosstalk detector. Roll-off at 10 mm imaging depth is <12 dB, ensuring high clarity images even at extended depths. Spatial resolution is similar to the comparable model from our Cobra 1300 series, or slightly better. 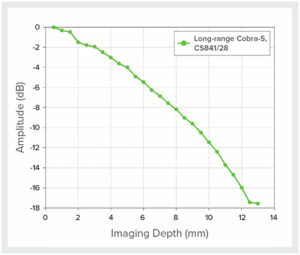 Due to the shorter center wavelength of the Cobra-S 800 long-range imaging model, scatter in tissue will be higher, though absorption in water will be lower. This may change the contrast of structures slightly, and in some cases offer improvements in differentiation, i.e., for some inner retinal structures such as ganglion cells. By offering comparable image resolution at a much more cost-effective operating wavelength, long-range imaging at 800 nm has the potential to open up new opportunities for the practical application of long-range imaging in ophthalmology, medicine, and industry. Explore the full specifications here, or contact us at info@wasatchphotonics.com to learn more.